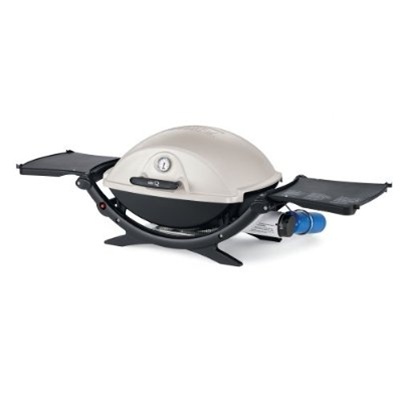 If you are looking for a grill that has amazing features yet is easy to use, look no further than the Weber Q220 Gas Grill. It has a cooking area of 280 square inches which means that you can grill up to 15 hamburgers at once. That is a large cooking area considering that it is a portable grill. It also features a built-in thermometer so that you can easily check what your food’s cooking temperature is and adjust the fire as necessary. The all-new Weber Q 220 has a taller lid than the Weber Q 200, so you can grill a bigger roast. A built-in thermometer and fold-out side tables round out the neat-o features on the Weber® Q™ 220. Optional propane hose is available in our accessory section below. What Accessories do I need to use Weber in Hong Kong? For a limited time we are offering for FREE a Weber Propane Adapter 4 foot hose which will allow you to hook up your new Weber to a Hong Kong propane tank. The gas company will attach an HK style regulator to the Weber tubing and then you ready to light it up. Just ask us and we will provide you with the contact details for our Esso Supplier that will deliver a tank right to your door. The Q220 can be placed on top of any table top but if you would like to stand in front of it you have the option to purchase one of the two types of stand up carts available below. We offer 2 types of covers below. One type if you simply purchase the Q220 without stand and the other with stand.